On Wednesday, October 16, 1940, 25-year-old Beuford Astor Bost stood in line at his local draft board in Mecklenburg County, North Carolina, to register for the first peace-time draft in U.S. history. He was one of over 16 million men throughout the country to do so that day. Bost was 5’ 8” tall, 152 pounds, with blue eyes, brown hair, and a light complexion. He worked at a soda shop located at 831 North Tyron Street in Charlotte. His mother, Ethel Lee Bost, lived in Concord, NC. We know this information—and more—from a draft registration card signed by Bost. It’s one of over a million recently added images in Fold3’s newest collection of WWII Draft Registration Cards. 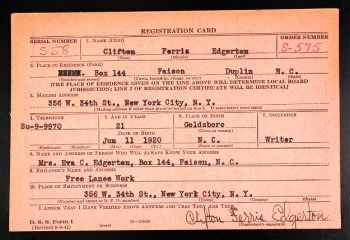 By the end of the war, there were five more registrations, including the “Old Man’s Draft” Registration (also on Fold3), plus an “Extra Registration” for American men living abroad. A Second Registration was taken on July 1, 1941—still prior to U.S. involvement in the war—for men who had reached the age of 21 since the first registration, less than nine months earlier. Clifton Ferris Edgerton was born in 1920 and turned 21 on June 11. He was a free-lance writer, living in New York City. He registered at a draft board in Duplin County, NC, and provided similar information, adding that he had a scar on his forehead. What his registration card doesn’t tell us is that he’s buried in the Henri-Chapelle American Cemetery and Memorial in Belgium. He died on September 19, 1944. He was a sergeant with the 87th Armored Field Artillery Battalion. 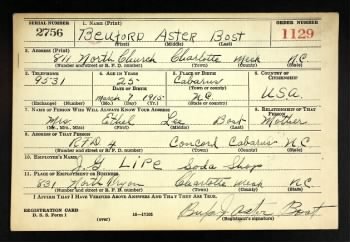 The Fold3 description for World War II Draft Registration Cards provides more details about the various registrations and more images and stories. Currently, draft registration cards from North Carolina are the first to become available on Fold3. Start searching the WWII Draft Registration Cards.